What's Your Budget Black Hole? For teenagers or just anyone in general, it’s always extremely difficult to save money. Sure, it’s easy to talk about it or learn about it in class and think it’s a good idea. But actually doing it? That’s a completely different story. We are very impulsive creatures and there are all sorts of reasons why we spend money without thinking about it, or without caring at the moment about the consequences of it. It’s so easy to spend money to “fix” a bad day, or a bad mood, or just to distract yourself from reality for awhile. When you realize you've run out of money, you may regret your decision. The knot in your stomach begins to tighten. I’m sure you’ve all heard of black holes. 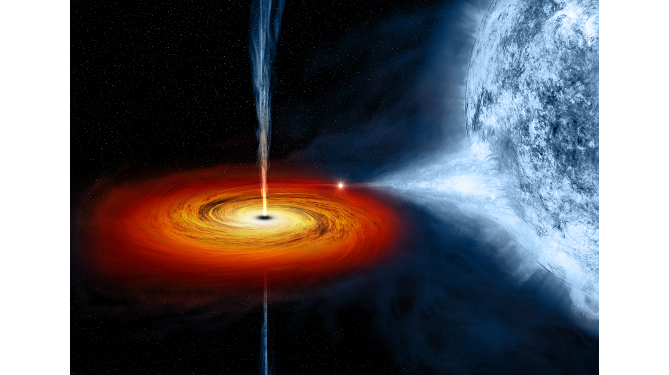 But did you know that black holes and budgets go hand in hand? If you're having difficulty sticking to a budget, or saving your money, you may be unaware of your budgeting black holes! So that’s where it all goes! No, there’s not really a black hole in your wallet, pulling your money into another universe! You are the one sucking it out, and most of the time without even realizing it. That's why it's important to learn how to keep track of your spending. Budget black holes can be caused by anything! They can be anything from you’re daily latte purchase, to impulsive book buying, to eating out, and taking trips to the movie theater. They may be areas in which you think you may not spend a lot of money and, therefore, don’t worry about, but they become black holes when they go uncalculated. They add up, and BOOM! Suddenly you’re hit with a reality check. You’re broke! Therefore, find out what they are and keep track of them to save yourself from the horrors of being broke! What are your budget black holes? Find out what they are! PAY ATTENTION to ALL of your purchases, especially the “little” ones! If you find that you’re always broke a few days after pay day, then maybe occasionally skip the coffee or trip to the movies. Don’t give them up, just learn when to put spending off for another few days, making it even better when you do buy something (and you’ll be guilt free)! College Isn’t Cheap – Fill Out Your FAFSA! As Sophomores and Juniors, you may hear your Senior friends talking about “FAFSA” a lot. You may figure, “no need to worry, I’ve got years before that.” Then, you wake up. Your parents are freaking out about your college applications, and senioritis is seriously kicking in. You might ask yourself what in the world does this have to do with me? However, if you are in high school, or are considering going to college or returning to college, this has everything to do with you! Many students do not know how easy it can be to get money to help with college. The FAFSA website mentioned above also goes over many fears or myths that students might think would stand in their way when it comes to receiving money for college. These may include thinking that you or your parents make too much money so you won’t qualify for aid, that you have to have good grades to receive aid, that you’re too old for financial aid, or even that the form is too difficult or complicated to fill out. NONE of these are true! We already went over why you need it, so let’s go over more specifically what it is. It is merely a FREE application for federal student aid that can come in different forms including: federal grants, loans, and work-study. See how easy it is to be walked through the application process and have all your questions answered. Visit the above mentioned website - https://fafsa.ed.gov/help.htm. Also, be sure to check out this awesome website https://getschooled.com/fafsa-resources. This website, Get Schooled, has tons of helpful tips and links from not only the experts, but also students like you. Go check it out! It’s not scary at all. The earlier you make your purchases, the greater chance they will arrive on time. To cut down on shipping costs, try to order many items at once from a single retailer. Your purchases should be lumped together into one large package with one shipping fee attached. By registering with an online retail site, you can start your online shopping and any items in your shopping cart will be retained until you either delete or purchase them. Then, you can ship everything at once and at one price. Many online retailers offer free shipping on purchases over a certain dollar amount, and online coupon sites regularly offer free shipping coupon codes. If you can’t catch a break on shipping, ordering early enough will allow you to choose standard shipping. It’s always the slowest method, but if you order early, it should get to you on time. Give yourself a little more time if you are ordering from a third party vendor through a big online retailer. Online shopping presents consumers with a wonderful new advantage – the ease of bargain hunting. Prior to shopping via the internet, finding the lowest price for an item meant using catalogs and circulars, traveling from store to store. Not so much anymore. Often, a simple Google search of the item you want will find even better deals. Search discount sites for the item you want before buying it elsewhere. These retailers purchase excess items that manufacturers could not unload on other retailers at a discount and generally pass the savings onto customers. Don’t be afraid of purchasing refurbished items either—this is often more surplus inventory. Do a quick search for coupons for the retailer available on other sites. Many stores will happily provide you with their own promotional codes if you sign up for their email newsletters. Enter the code before you check out to earn the savings on your purchase. Online shopping could eventually mean not so many physical retail stores, but even if that happens, the warehouse will always be there to storage merchandise and to employ people to stock these warehouses. If you return an item, it still has to be repackaged and replaced, although the retailer has not made any money from the return. As a result, online retailers have begun to charge restocking fees on returned items. Before proceeding to checkout, familiarize yourself with the retailer’s return policies. Simply packaged items like books or defective products should not cost you any more money to return. There are some measures online shoppers can take to minimize their risk. First, ensure that all online shopping is carried out only on secured sites. It is advisable only to use credit cards rather than debit cards, for online shopping. Credit cards are an extension of credit while debit cards withdraw directly from your bank account. Once in possession of your banking information, hackers can do much more damage to your finances than with your credit card number. Using only one credit card for online shopping is another great way to shop on line. The potential for fraud is limited to one account. Remember, online shopping, while convenient, could pose more risk. 1. Enjoy an unlimited parade of top sirloin, lamb, picanha, smoked ham, shrimp, salmon and much more, all hand-carved tableside, along with an extensive all you can eat buffet bar! 2. Support Andson's academic after-school programs – every dollar counts, and will go directly toward helping our Homework Help & Tutoring Program. 3. Participate in Nevada's Big Give – Pampas will make a final online donation on April 25th that will count towards Nevada's big goal. Dine out and give back – that’s Fullanthropy! ... vegetarians can join us as well. Savvy Shopper's Corner! Some Tips For Smart Shopping! Every day someone overspends when shopping at the grocery store. Often, items end up being tossed out or never used. Here are a few helpful tips to cut back on excess spending when shopping at the supermarket. 1. Make a list! It only takes a few minutes to prepare but it will save you from wandering down the aisles and prevent you from shopping for unnecessary items. 2. Substitute supermarket brands for brand name products. You can save on generic, non-perishable snacks, cleaning products, paper goods, and diapers. If you are used to brand name goods, try swapping one or two items to start. Even switching a few items on your shopping list will help you keep more money in your pocket. 3. Buy ingredients rather than prepared products. If you have time to make your own pasta salad at home, you can save money by preparing it yourself versus buying it pre-made at the store. 4. Convenience is costly! Buying fruits and vegetables and cutting them yourself is cheaper than buying pre-cut fruits and vegetables that cost double the price. 5. Learn to buy in-bulk! Buying larger boxes of cereals, crackers, and snacks will last longer. Stock up on items on sale that you use often and store in pantry with early expiration dates in front. 6. Using store and manufacturer coupons can also reduce your total costs at the checkout. 7. Buy a filter for your tap water! It will be more cost effective than buying bottled water.